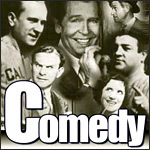 Amos 'n' Andy debuted on March 19, 1928 and quickly became the most popular program in the history of broadcasting. Each night, a third of the nation's populace tuned in to hear the comic misadventures of the proprietors of the Fresh Air Taxi Company. The storylines dealt with the pursuit of love and money, age-old themes that struck a chord with Americans suffering through the Great Depression. Freeman Godsen and Charles Correll played Amos Jones and Andy Brown, who symbolized the best and the worst of the average American - from their kindness and common sense to their self-importance and susceptibility to the lure of an easy buck. (6/1/1945) ANDY ENGAGED TO HATTIE MCDANIEL?